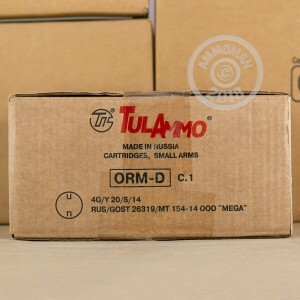 TulAmmo, produced by Tula Cartridge Works, represents the end product of lessons learned in quality and efficiency over 125 years in ammunition manufacture. As a result, this ammunition is not only affordable but runs reliably in AK pattern rifles, Ruger Mini-30s, SKSs, and any other weapons of this caliber. This bullet weighs in at a very common 122 grains and shares weight with many common soft point and hollow-point hunting rounds. They are loaded into steel casings which are not reloadable (partly due because of being primed with non-corrosive Berdan primers) and are coated with polymer to help reduce parts wear. The bullets feature a bi-metal* Full Metal Jacket and exit the muzzle at 2,396 feet per second. *Bi-Metal jackets are usually made from a layer of mild steel and coated by an alloy of copper and zinc. Although they are not designed with any armor-piercing capabilities, some indoor ranges will not allow the use of bi-metal jacketed ammunition. Please check with your local range before use. I shot 600 of 1000 and every Bullet fired and did not jam. The grouping of them was about 80%. A couple of the bullets went way of course but for the most part were accurate. I always buy Tulammo, it always performs well. Great product . Thank you Putin. Love Tulammo. Fast Acc. and cheap. That's what I like...no hassles and no surprises. I'll be back! Shoot a little, stash the rest. Mostly for stash for my SK--hope I never have to use it. Great deal!! Fast shipping!! I will do lots more business with these guys!!! No issues all ammo was great! And a bargain! Works great for my purpose, no problems. Good round for my akm. Good Stuff - Great Supplier!! Ordered the 1000 bulk box. Arrived at my door on three days ... actually less if I were to take into account "hour of order to hour of delivery"
Running this ammo in AK47 and AR47. Neither machine has had an issue with these rounds. We're all plinkers here, enjoying the sport for what it is. However we do like the challenge of some distant targeting. AGAIN, no issues. I CAN'T SAY ANYTHING ON THE NEGATIVE ABOUT THIS AMMUNITION. Both the HP (ordered earlier) and FMJ 122 seem to hit like a mule. popped off 750 round in 1 day. not a single misfire in my sks or ak. Great price and service, arrived very quickly. Have already recommended you guys to friends, will be ordering more (but I am pretty well stocked right now). This ammo is tough to beat for range use! Not a single jam or misfire!! I had no misfire's in the couple hundred rounds I shot so far. I will definitely buy more. I haven't had the opportunity to use the ammo, but I'll let you know when I do. Have ordered both 5.56 and 7.62x39 in bulk. Ordered on Thursday and arrived on Saturday in rural Wisconsin. Couldn't ask for better service. priced good and actually accurate. Based on my experience, this round performed pretty well on both of my AKs. Never had FTF or eject and I was able to shoot pretty tight groups. Tula is what it is, cheap and reliable. I run it all day in my SKS and it does exactly what its meant to do. Ammo is cheap but when the bang every time. Through an AK that's all I was looking for. Ammo was fine but I was most impressed with the speed of processing and delivery! Great guys and will be back. product was great and as described. i will definitly be coming back for more. Ammo was great. I have fired right around 200rds so far without a flaw. I will be coming back for more. Great ammo and services. Good friend has gotten some AR ammo from you and I will send you my finders fee. HAHA. Will get more ammo when I can!!!! Great place for reasonable priced ammo. Great stuff, runs perfect so far. No misfires and accurate what more can you ask for ! Great product at an unbeatable price. Super easy transaction with fast delivery as well. 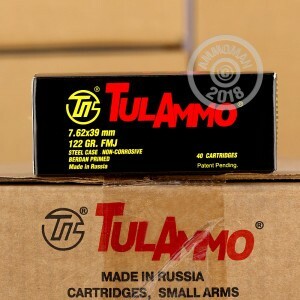 Typical tula ammo quality. I will buy all my bulk ammo from the Ammoman! Super transaction! Will do business with AGAIN!!! A+++++++++++++++++ SUPPLIER! Thanks!! Good Honest and reliable! What more could you ask for? Thanks a bunch! My AK-47 ran flawlessly using it. Flawless through our Wasr 10. Great price, would definitely buy again. This ammo performed well. Good grouping at 100 yards. I would order again. I have shot more than 1000 rounds of this exact ammo; don't remember ever fail to go bang or eject. I shoot from my American made I.O.Inc M214 Tactical. Both work PERFECT together! From around 50y, using bipod, I shoot very close groups within 3.5" target. I have friends in the military and police; they are very impressed with the gun(and the ammo, I guess), so they are ordering the same too.... I also use Tulammo 9mm for my handguns with the same excellent results. Recently bought 154gr soft point(Tulammo too), but haven't tried yet. Overall- I am very happy and will continue to buy this brand in future.